Welcome to Lisa.B.Designs : Lace, Ink, Paint, Stencils, Flowers and Stamps all on ONE Card? Lace, Ink, Paint, Stencils, Flowers and Stamps all on ONE Card? Good morning all! Martina here with another make featuring the Take Time and Time to Celebrate Stamps designed by Lisa B. for Imagination Crafts. This week I decided to go for a 'vintage pretty' look for my card, using a couple of techniques I haven't played with in a while. Now any of you who know me from the classes will know I have 'issues' with not going overboard on my makes...I warn you now, this is not card for the minimalist amongst you! using an old copy of a book, I tore out a couple of pages and then ripped them both (I think it was Wuthering Heights if you're interested, and yes, I do have another copy!) I inked the pages with some more Gathered Twigs Distress Ink, making the ripped edges slightly darker. I then stuck the pages to my base card, letting the stencilled pattern show through and trimming the edges. 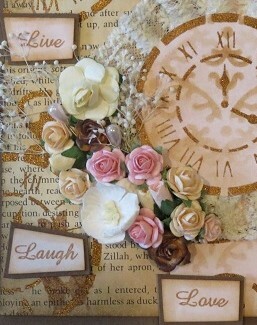 The next layer was created using Topaz Starlight Paint and the clock face from the Imagination Craft's Time Stencil. I also added some of the little embellishment stamps from the Take Time and Time to Celebrate Time Stamp Sets all over the topper. I decided I wanted to add some real dimension to my main feature, so going back to step one, I inked another piece of card in the same way, big enough for me to stencil another of the clock faces onto. I only needed the centre section.